Yessss, it’s been a little quiet in my corner of the internet for the past 6 months…but I’m back! My blogging hiatus was never really planned, it just kind of happened. I promise you there’s a ton of drafts waiting for you all to read…and if I wrote “publish/finalize blog post” on my weekly planner one more time without actually going through with it I was going to scream! As some of you may know I am all about that teacher life now, I graduated with my Masters in Teaching back in May, and I practically spent my summers by the pool preparing for my first year as a teacher then BOOM, August was here (Time to be Miss Frinks). Time away from kayfrinks.com was hard but you know….priorities, I was constantly stuck between creating content and creating lesson plans…my fellow teacher followers know how getting those lesson plans to perfection before the weekend can be; just to mark them up because you decided to do something different by Monday morning. 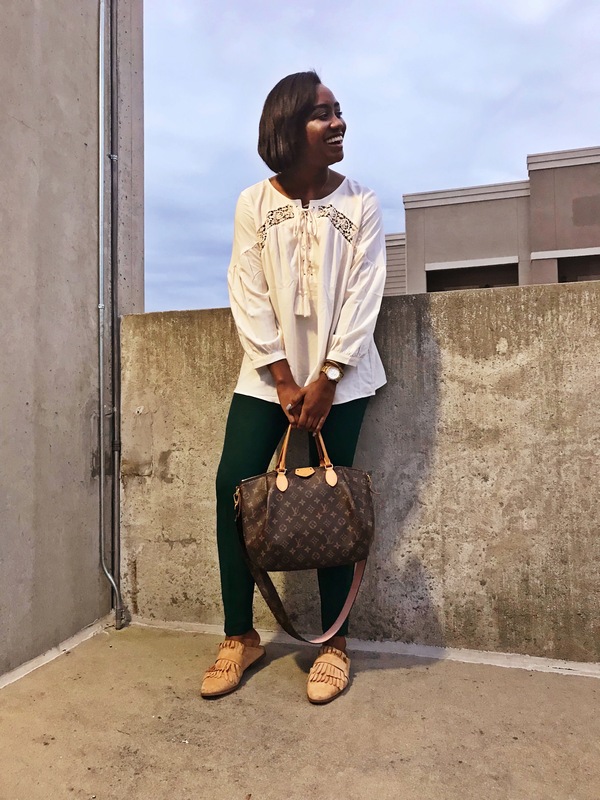 I am so excited to introduce to you the new #workwearwednesday segment on the blog…that’s right, every Wednesday I’ll share a few teacher inspired outfits that would be perfect for any young professional gal. I’ve enjoyed the break but I’ve missed it at the same time, but let’s be honest, this post is way overdue. So let’s get to it…. Let’s just say these pants fit like professional pajamas, they’re a must; I love the bbohemian style look the blouse gives off. Pair this with a bootie or slide (pictured below from Shoes on King ) and you’re good to go! Previous post ← Fringe & Tassels​.